We have already clarified that Tibetan Buddhism was thoroughly imbued with a Tantric outlook, which is usually traced back to Padmasambhava, and which continued to be an important part of the total system. But Tantrism by itself does not constitute Buddhism. How does one understand the nature of the world or the realization of Nirvana? For Tibetan Buddhism questions such as this one find their answers in the Mahayana school called Mulasarvastivadin. The Mulasarvastivadin sect provided the understanding of reality and the rule of discipline observed by the monks. For the most part, the three older schools of Tibetan Buddhism, sometimes collectively called the "Red Hats," found common ground in these matters. It was only with the eventual coming of the Gelug order that the underlying Buddhist thought started to head into a different direction. 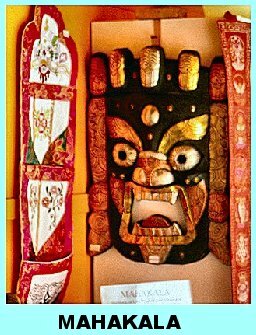 Some Tibetan deities are known as "Protector Gods." They may shield individuals from harm, but--more importantly--their chief function is to protect the Buddhist dharma. In the Theravada section of this website, we mentioned that among the early Hinayana schools, there were several that were collected under the heading of Sarvastivadin, specifically the Vaibeshika and the Sautrantika. What they had in common, in contrast to the Sthaviravadins, was that they believed that "everything exists." All objects, or better: perceptions (dharmas), including those of the past, present, and future, exist simultaneously. What gives them order in our experience so that we identify causes and effects correctly is precisely (and paradoxically) our experience. Further on, in the general Mahayana section, we showed that this way of understanding the nature of reality easily led to the conclusions of the Yogacara philosophy. To review, as opposed to the Madhyamaka school with its belief that nothing exists because nothing has an intrinsic essence, Yogacara held that nothing exists because it is merely a perception of the mind. The term Mulasarvastivadins can be easily broken down into two parts: mula, which means "root," and Sarvastivadin , which, of course, refers to the aforementioned Hinayana school. 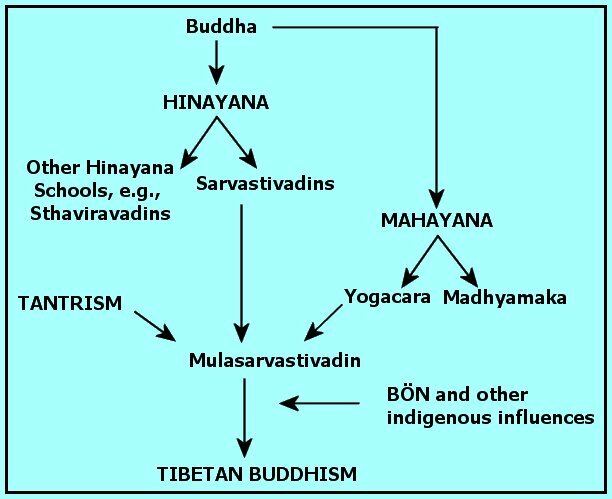 So, this school is the Mahayana school that has its roots in Sarvastivadin thought. One of the places where the Yogacara orientation of Tibetan Buddhism particularly shines through is in the so-called Tibetan Book of the Dead, Bardo T�tol. This short version of the title, Bardo T�tol, is simply "Intermediate State Hearing," where Bardo is the "intermediate state" between a person's incarnations, and T�tol is "hearing," but the full name is more along the line of "On Attaining Liberation in the Intermediate State upon Hearing." The title, "Book of the Dead," was invented by the first English translator as an analog to the "Egyptian Book of the Dead." The various sections of this book are supposed to be recited on behalf of a newly deceased person in order to encourage him to make one final attempt at attaining Nirvana. The key is to get the person to see that all of his life as well as his present post-mortem experiences are not objectively real, but are merely perceptions residing in his own mind. The book is divided into three sections, corresponding to the experiences of the deceased person. The Chikhai Bardo. The first thing that a person encounters immediately after death is a bright light. This light is apparently engendered by Amitabha, the Buddha of Infinite Light. But there is no Buddha, and there is no light. The entire experience is simply one of the person encountering his own mind, and there is no self to which the mind is connected. As soon as he recognizes this fact, he is freed from all karma and need never be reborn. Nirvana is his. This phase can last up to three and a half days. The Ch�nyid Bardo. The next stage can take as long as two weeks. Over the first seven days, the deceased sees various Buddhas, along with their Bodhisattvas and other attendants, each one illuminated with one of four different colors: red, green, blue, and yellow. Again, all it takes for the person to see that all of these lights are actually nothing more than his own perceptions, and he has been liberated. The next seven days are also characterized by bright lights of different colors, but this time they stem from horrifying appearances of various deities. At this point the spirit should not be intimidated, but realize that these threatening-looking beings are nothing because he is nothing. Therefore, they can do him no harm, and, in fact, they cannot be anything but products of his own mind. This realization would once again grant him immediate access to Nirvana. The Sidpa Bardo. The person who did not see himself in all of the various perceptions of lights must go on to enter another incarnation. The third section of the book consists of describing to him what he must experience now in getting ready for the next life. His former body (or the illusion thereof) gives way to a new one, which will be appropriate to whatever level of existence is his lot (god, demigod, human, animal, hungry ghost, demon). These six realms will be presented to him, each with a certain level of light. Depending on the karma of the deceased, one will appear brighter to him than the other five, and that is the level to which he will be reborn. The results will be finalized no later than 49 days after the death. We see here that, in keeping with a Mahayana approach, theoretically Nirvana is open to any person. In practice, the monks (lamas) are really the only ones with a definite chance. Lay persons, just as in Theravada, occupy themselves with earning merit and building good karma for future lives. 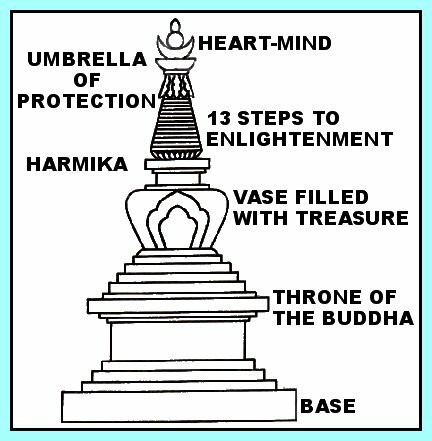 The Tibetan Buddhist understanding of enlightenment is illustrated by its version of the stupa. 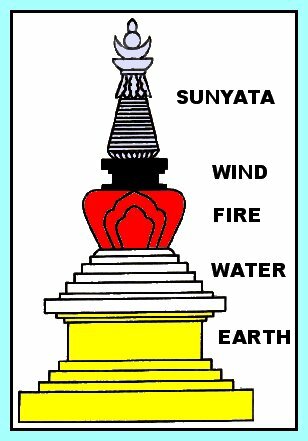 A stupa is a tower-like building, which may have initially developed from burial mounds that got fancier as time went on. They usually contain remains or relics as well as other holy objects. 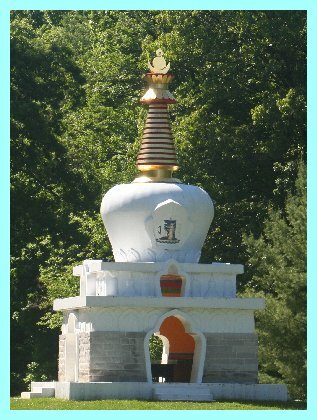 Tibetan stupas, called "chortens," have their own unique shape and attributes. Here are two examples. First of all, one sees an obvious difference between the "Memorial Chorten" and the "Kalachakra Chorten." It is possible to walk into the the Kalachakra Chorten. There are two mandalas (sacred diagrams, discussed later) inside of it, and people can meditate within it. The Memorial Chorten is the more usual one. It is rich with symbolism. As a matter of fact, there are several ways of understanding a chorten. Here is a basic diagram of its parts. 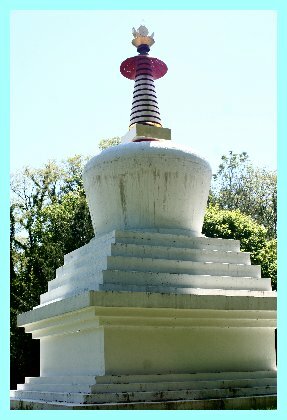 A chorten can be understood either as a representation of the Buddha's enlightenment or as a reminder to others to follow the path to Nirvana. It's symmetry stands for the Buddha's own symmetry in his spiritual body. 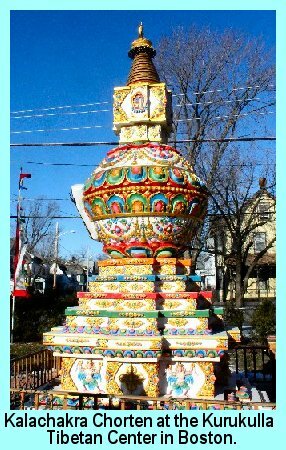 We need to think of the "vase" first of all as containing the spiritual treasure of the Buddha's teachings. Secondarily, this place may also be where the main relics are stored. However, there are usually many holy objects buried beneath a chorten as well as built into the structure. The "harmika" is a platform. More ancient stupas of somewhat different design show evidence of railings, leading us to infer that at one time people used that place to stand and meditate. The most important part is, of course the top, where we find the symbol of the heart-mind releasing spiritual power. Here is another way of interpreting a chorten. The universe of reincarnation (samsara) is much larger than the realm of human beings. As we mentioned above in connection with the Bardo T�tol, there are six divisions into which one may be reborn. On the next page we will look specifically at how these realms are divided in the Tibetan Wheel of Life.